Epson announced the launch of PictureMate PM520, an upgraded and improved version of the super successful photo printer,PictureMatePM245. The PictureMatePM520 offers borderless photo printing upto 5×7” &printing with border up to A5 size. The product is perfect for small photo studios as well as tourist photographers looking for instant prints due to its portability, and fills in the requirement of printing 4×6, 5×7 & A5 prints. The product is wireless and supports WiFi and WiFi direct along with other Epson connect features. The printer consists of a 2.7” LCD screen and supports connectivity with an SD Card. The new printer comes with an optional battery and a warranty of 1 year or 13,000 prints (whichever comes first). Epson entered the instant photo printing market a decade ago with PictureMate PM100, which was mainly targeted towards home/personal use. The product quickly became popular amongst small photo studios and tourist photographers. The acceptance was understandable given that printing of passport photos and colour photos were not done in-house by the photo studios but were instead done in labs and then sent back to the photo studios. With the introduction of the PictureMate printer from Epson, photo studios could print photos in-house which reduced the output time to deliver the final product to the customer. Thisdifference lead to a vast increase in business for photo studios. Even when it came to instant photos at tourist locations, various products were tried & were not up to the mark when it came to quality of pictures produced. PictureMate brought in superb quality of prints with ease of maintenance & low cost of print. The market for instant photos at tourist spots flourished rapidly thereby creating a livelihood for a huge number of people. Industries have evolved and become fast paced. Photo studios are interested in servicing their customers faster. Even at tourist locations, customers want instant printouts of their photos rather than coming back at a later time to receive the final photo print out. 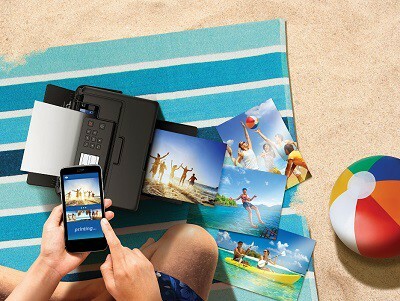 Considering the requirement of the market for instant photo printouts, the PM520 is a rugged, compact and portable printer that can be used by photo studios and photographers at tourist locations for instant photo printouts. Commenting on the launch, Mr. Siva Kumar, General Manager, Inkjet Printers said“We are excited to announce the launch of our new PictureMate printer – PM 520. We have recognised the need for an upgrade from PM245 in the market, and through PM 520, we aim to fulfill the requirement for printing 4×6, 5×7 & A5 outputs in studios & tourist locations while keeping the product handy & compact”. The PM520 costs MRP 19,999 while the refill cartridge costs MRP 1,429. The PictureMate printer from Epson is the most preferred product in the photography market. The brand, Epson is known for its high quality, efficient products that are used by millions of users around the world. Epson Announces The Launch Of Their New Color Inkjet Picturemate 0 out of 5 based on 0 ratings. 0 user reviews.